It was the great desire of Reverend Joseph W. Cook to come to Cheyenne and minister to the Indians. However, when he stepped off the train January 14, 1868, he found that there weren’t any Indians needing his services and their relationship with the white settlers was quiet for the time being. However, there was a flock of Episcopalians that welcomed his arrival, and the town had a bumper crop of “gamblers of all shades, and roughs and troops of lewd women, and bullwhackers” who could use a little guidance from time to time. Building on this early success the Reverend held a meeting the next week to organize the church. Two lots were purchased from the Union Pacific Railroad, probably at the rate they charged churches which was $1.00 per lot. And by August 23, a frame church was completed and consecrated. The Church was named St. Mark’s in honor of St. Mark’s in Philadelphia that donated $1,000 for the establishment of the new church. It was the first church built in Cheyenne, and Reverend Cook, no slouch when it came to hard work, made the imitation stained glass altar windows himself. By 1886, the congregation had outgrown the frame church, so plans were made to build a new, larger church. Traditionally, it is thought that the design of the church was patterned after the Stoke Poges Church in Buckinghamshire, England. Many of the congregants of the church were cattle barons, so funding for the new building was not anticipated to be a problem. However, in the midst of building, the winter of 1886-87 hit Cheyenne and Wyoming hard. Blizzards, deep snow, and cold temperatures wiped out entire herds of cattle. Most of the international ranch owners were wiped out and returned to Europe. The local ranchers that were left suddenly had significantly less disposable cash to contribute to the church. The new building was walls with no roof for two years. 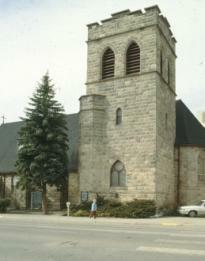 The church, with the exception of the bell tower, was finally completed in 1888. The portion of the bell tower that was completed was capped off, and the line where the newer, darker stone was added can still be seen. In 1924, the bell tower was completed, and a chime of bells was placed in the bell tower along with the bell from the original frame church. There is also a mysterious room in the bell tower. It is yellow with light blue trim, and a good, solid floor. It serves no known purpose. One explanation for the empty room goes back to the original construction of the church. Two Swedish stonemasons were hired to build the tower and steeple since they were skilled in Old World masonry. When the tower was forty feet high, both stonemasons disappeared and construction on the bell tower stopped. When construction restarted in 1924, workers complained of mysterious whispers, strange tappings, and other supernatural events. Thinking the bell tower was haunted; they convinced the rector that they should build a “ghost room” just under the belfry in hopes of appeasing the ghost. It evidently worked since the bell tower was completed on schedule. Many years later, a colleague of the Swedish stonemasons came forward and explained their disappearance. He said that one of the stonemasons fell to his death while working on the bell tower. Afraid that he would be deported, his friend entombed him in the wall of the tower and disappeared into the night. Could this be the ghost that now inhabits the yellow and blue room in the bell tower? Or is it just a story to be told around a roaring campfire? Cheyenne Landmarks, (Laramie County Chapter of the Wyoming State Historical Society: Cheyenne, WY) 1976. Flynn, Shirley E., Our Heritage, 100 Years at St. Mark’s, (St. Mark’s Centennial Committee; Cheyenne, WY) 1968. “1981 Historical Calendar,” (Frontier Printing, Inc.: Cheyenne, WY) 1981.